I wanted to throw an idea out there that I came up with starting from my husband and I's very first Valentine's Day together. 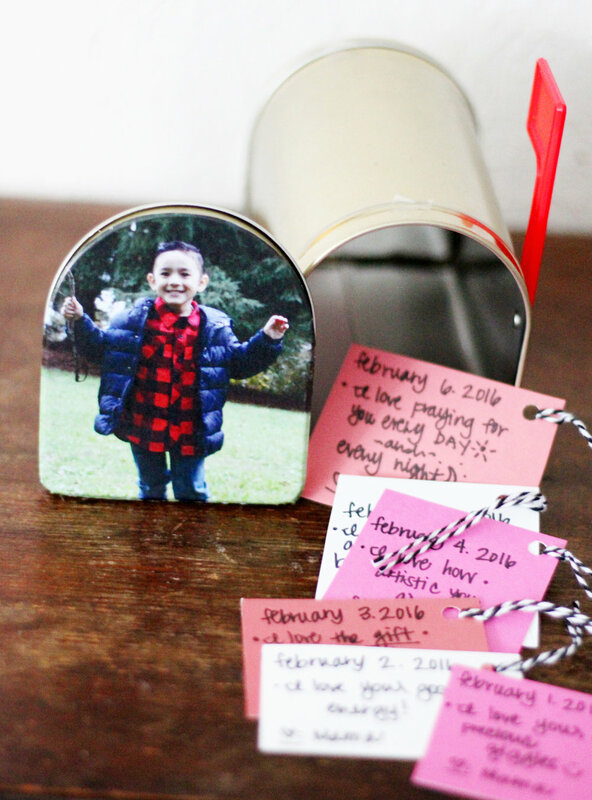 Before my husband and I had our boys I would set up a little mailbox for each of us where we would write fourteen things that we loved about each other, fourteen things for the fourteen days in February before Valentine's Day. It became a fun little thing to open on Valentine's Day either before our date or after, I myself was excited to see what what he would come up with on those little notes. This definitely makes me feel special every year and reading those words of affirmation/love notes coming from my husband really make me happy. Especially when I'm having a rough day and I'm exhausted, opening that little mailbox here and there always puts a smile on my face. After babies I decided, why not keep up the now tradition and make little mailboxes for them as well? We started the tradition with them last year and I decided to decorate our boys mailbox with a picture of each of them. In the past I had always just written our names on the front but I really liked the visual effect that their picture had. Plus how adorable are they?! On Valentine's Day before Mama + Daddy went out for our dinner date, I read the fourteen things (even though there's tons more) that I LOVE about each of my babies. They loved it! Our oldest giggled the whole time and I could tell it made him feel really special, our youngest didn't really understand but he laughed along with his brother which is adorable! Here's the recap of our mailboxes from last year! I'm excited to share the ones I've come up with for this year as Valentine's Day draws closer! You could make these for Valentine's Day or any occasion really, this year I have already started including the boys even more and having them write (I'll be writing for our youngest!) a few things they love about Mama + Daddy and each other. * Mailboxes from Target * Look for them in the dollar spot section, they offer super cute ones every season! This super cute Valentine’s Day Robot DIY is a pretty easy Kids’ DIY to make with an adults help, and it will help you start decorating for Valentine’s Day! This projects is also a good idea if you’re a teacher needing a project for your class ... what better to collect adorable Valentine's from your classmates with than these Valentine’s Day Mailboxes? Have fun making these and getting ready for LOVE month! This project isn't very messy, there is some gluing with the hot glue gun and paper cutting. 2.) Next measure and cut a card stock square to fit over the opening you just cut. The color of card stock doesn't matter because you won't see this in the finished product, it's just to close the opening and for re-enforcement. Glue that down with the hot glue gun. 3.) 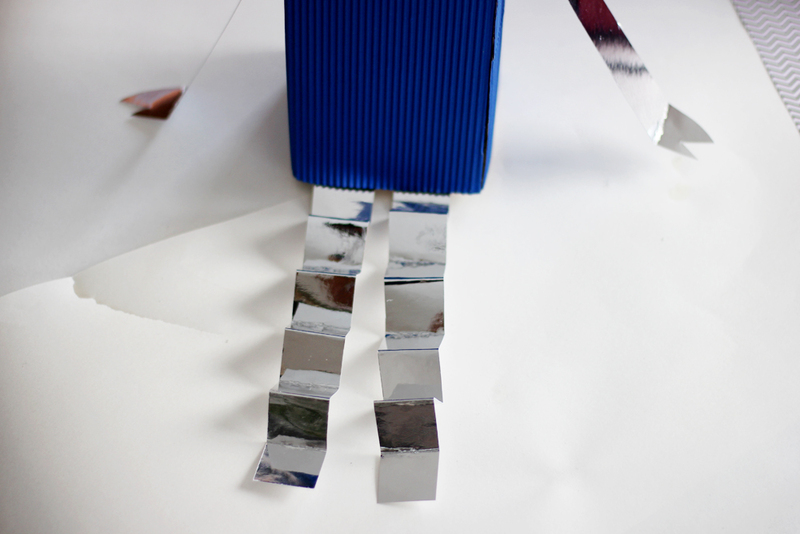 After that, help your little one measure a card stock piece in the color you want the robots' body to be and cut it out. We used a 12 x 12 card stock piece, so the piece we measured wrapped around 3 sides of our container and we used the remnants of the card stock to cover the last side. 4.) Then wrap your card stock around the container, gluing it down as you go. 5.) The next thing we did was measure, cut, and glue a square piece of the mirror card stock to go over the previous layer of card stock square that covered the top. This will end up being the Robots' shoulders. 6.) Mark and cut out the bottom part of your cup, this will be your robots' head. We used a glass to help us measure and mark a straight cut all the way around our cup. 7.) 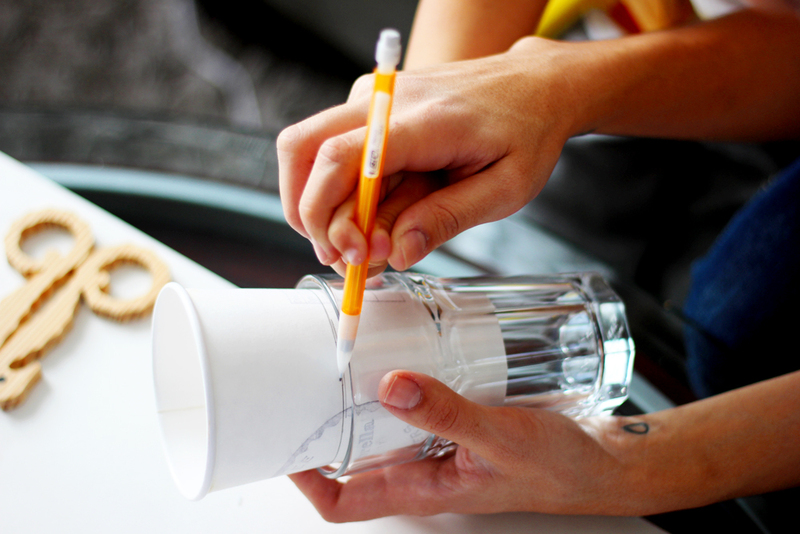 Trace a circle around the top side of your newly cut cup onto the back side of your mirror card stock, then cut a circle 1 cm wider than this circle so that it's easier to attach the card stock to your cup (the top of your robots' head). I cut little tabs all around my circle and folded them in which made it easier to glue down to the top of the cup. 8.) 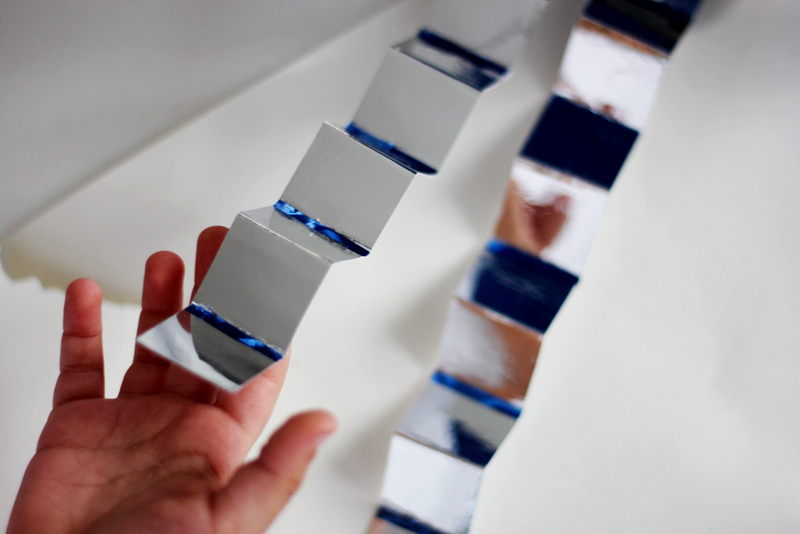 After you glue down the top of your robot's head; measure, cut and wrap a piece of the mirror card stock all around the width of the cup (gluing it down as you go). Then you can glue this to the carton top (this will be your robots head and body). 9.) Cut 4 pieces of mirror card stock 1 inch wide, making 2 pieces 9 inches long and 2 pieces 11 inches long (these will be the arms and legs). Glue to the robots' body. 10.) Create a face out of sticky foam sheet and attach. I drew it and then cut it out. I had my little man attach it. I also added white puffy paint dots to give the eyes a little of dimension. 11.) Glue as many decorative tacks as you would like to the top and sides of the head. I also created a little tube with a piece of mirror card stock to lift the top pin, this is optional. You and your little one(s) can decorate your robot as much or as little as you'd like. // Cuddle with your Valentine's Day Robots + sit them on your favorite shelf, don't forget to revisit the Valentine's inside reminding you how amazingly loved you are. Have fun making these and tag @allkidsaregifted so that we can see how yours turned out! Can't wait to see! !